The new iPad has been out for a while now with the iOS faithful having the latest iOS slate in their hands, but what do those owners think of the latest bit of tablet tech from the Apple camp? Well a recent survey of 200 new iPad owners looks at their impressions of the device, and the survey was conducted from the 22nd of March to the 28th. The survey from ChangeWave Research shows overall satisfaction with the new iPad along with key likes and dislikes and the impact of that reported heat problem some have seen with the new Apple slate. 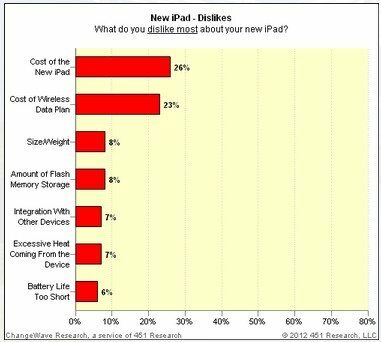 Apparently when it comes to user satisfaction, the new iPad is much higher than with previous iOS tablets showing that 82 percent of owners are very satisfied with the new iPad, whilst 16 percent state they are somewhat satisfied whilst only 2 percent say they are somewhat unsatisfied. Previously the figures showed that 74 percent where very satisfied with the Apple iPad 2 whilst 23 percent said they were somewhat satisfied with the iPad 2. When it comes to the best likes with the new iPad, 75 percent opted for the Retina Display, 22 percent went with longer battery life, 21 percent with 4G LTE connectivity, 20 percent for the faster processor, 18 percent for the 5 megapixel camera, whilst 9 percent opted for the screen size. When it comes to the dislikes, the majority didn’t like the cost with 26 percent, 23 percent disliked the wireless data plan, 8 percent didn’t like the size, weight and amount of flash memory storage, 7 percent weren’t happy with device integration, 7 percent didn’t like the excessive head of the new iPad whilst 6 percent said the battery life was too short. So there you have it, the latest survey on what new iPad owners think about the new iPad, but we’d love to hear from our new iPad owning readers out there about what they like and dislike about their new iPad, so feel free to share your opinions to our comments area below.